The problems and challenges facing organizations today in the areas of Personnel and HR Management are manifold. In view of this concern, the Association has designed this HR diploma course for personnel specialists whose aim is to enhance their present knowledge and implement new skills and techniques within their organizations. The HR Management course commences in March, June, September and December each year, and the application deadline is normally two weeks prior to the commencement date. Applicants can apply for exemptions for up to 2 modules of the programme before the programme commences. Application will not be accepted after the course has commenced. For details, please contact the Customer Service Department on 2774-8500. Admission is on a competitive and individual basis entirely at the discretion of the respective universities. Admission criteria and procedures are set by them and are subject to change without prior notice. The Association does not give any warranty and will not accept any liability regarding the above. 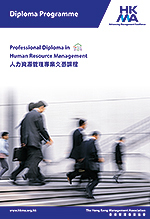 This HR Management diploma course can be completed in 10 months. It consists of seven modules, with a diploma being awarded upon successful completion of the course. Courses have been included in the list of reimbursable courses for CEF purposes.